Maybe I wasn’t paying attention to the lectures, classes, and studies I’ve done. Whatever it is, it has caused me great frustration in searching out American Indian families. But now I know why and now I know several potential solutions. You can find lots of resources to help you if you are researching one of the “Five Civilized Tribes” – Cherokee, Chickasaw, Choctaw, Muscogee (Creek) or Seminole. 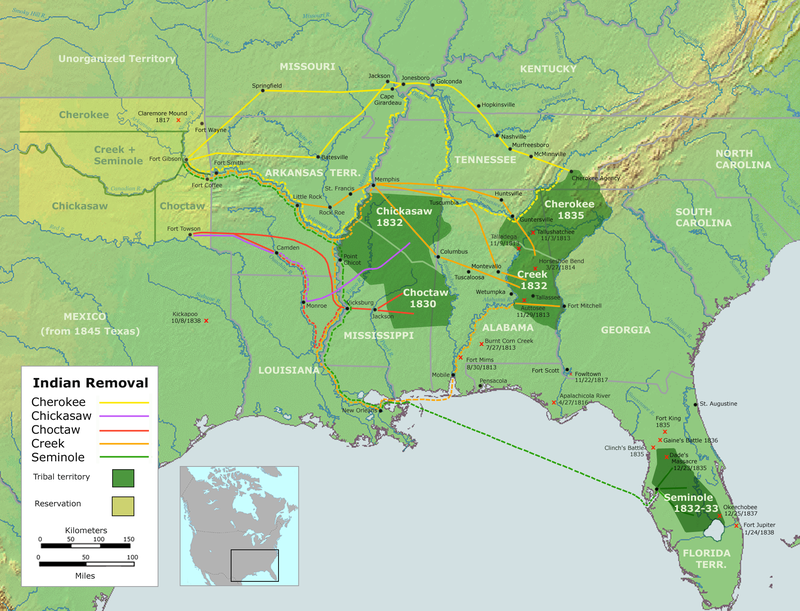 At least if they were forcibly removed to the new Indian Territories following the Indian Removal Act of 1830. Why? Because it was a federal action, there were treaties and other documentation. But what if they were not removed? What if they hid in the hills of North Carolina, Tennessee, Kentucky and West(ern) Virginia? No documentation for that. And they may have “transitioned” to white if they could – as did many people of varying ethnicity who had light skin. Sometimes census records recorded them as Mulatto or Black. There were others who remained on their lands and were not removed like the rest of their tribe. How? Legalese, my friend. So if you really want to keep your land and have your wits about you, there is a clear solution. Since Indian tribes and nations cannot own land, you can keep your land by not being a member of a tribe or nation. And some chose to do this – renounce their claim to tribal membership, become a citizen of the state they lived in, and continue on with life. This makes it tricky for genealogists, because by the language of the Act (and the nearly 70 removal treaties enacted thereafter), Indians could not live outside the Indian Territories, which means that – technically – there are no recorded births, marriages, deaths, etc. for Indians after 1830 because – legally – Indians did not live in, say West Virginia. Only Americans did. Fascinating, no? That’s not to say that some records may not exist (we are talking about people, here). But if your American Indian line stayed in the East, finding documentation to prove Indian heritage between 1830 and 1965 when it was once again legal to indicate Indian heritage (at least in West Virginia) is going to be really hard! trace to the immigrant ancestor of each line – if they immigrated, clearly that line cannot be American Indian; but this means tracing every single maternal line, too! search for naturalization records – if they became American citizens, perhaps you can find paperwork. Immigration and naturalization law changed over time, too, so you’ll need to do some research about the locality and time frame to see what the requirements were and where any documentation might have been housed. Maybe they just suddenly started paying taxes…so look for tax rolls, too. Have any of these strategies worked for you? What other techniques have you used to find American Indian ancestors? Wonderful! Thanks for letting us know about your book – I’m sure it is a valuable resource for anyone doing research on Indian ancestors in north Florida! Would love to hear what additional tips you have learned to help identify American Indian ancestors. And any differences you’ve noticed in patterns or law application from West Virginia and areas more northerly than Florida. All the groups of non federal indians in the east have ties to the carolina/virginia eastern siouan dispersal of the mid 1700s.. for the majority. . So far I haven’t tried. My Grandpa (my mom’s step-dad) is part Cherokee. He has some great stories of different family members. One who was on the Trail of Tears and one who was pretty fair skinned so just assimilated. This is a line I haven’t really researched much but it’s on my list for the future. I’ll have to try out some of these tricks. Thanks! Sounds like some family just waiting! Let us know how it goes, what worked and what didn’t! This entry was posted on 3 June 14 by KC Reid in Tools n Tips and tagged american indian, Cherokee, Cherokee Indian, native american, research tips, West Virginia.